Sarahí Almonte always knew she wanted to have a career that would positively change the lives of others, so she spent the first 15 years of her career as a community organizer. After being diagnosed with Stage 4 Endometriosis, Sarahi had a hysterectomy and had to spend a period of time recovering in the hospital. During her stay, she realized the nurses taking care of her had a great impact on her life. Not only were they taking care of her, but they were supporting and encouraging her throughout her healing process. Sarahí realized she wanted to become a nurse. She was accepted to and graduated from the Accelerated Nursing Program at Quinnipiac University. Then, in October 2014, she began her first nursing job at CHC Meriden. After working at CHC Meriden for over a year, a nurse supervisor position opened up at CHC Bristol. Sarahi saw the job posting and applied, and shortly after she was offered the job. 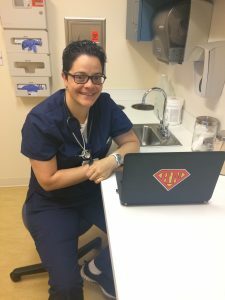 Although nursing is different from any other job she has had, Sarahí loves knowing she is making a difference in the lives of her patients. She expects patients to be honest with her so she can help in every way possible. The most important thing she can do is pay attention to all of the details related to a patient. Sarahí looks past her patient’s aliments and diseases and gets to know the real person. She loves being able to see changes for the better in her patients and she wants them all to know she will continuously be there to help them. Sarahí loves working at CHC because she feels supported and knows she has the opportunity to grow within the organization. Each day holds a different experience and she is always learning something new. Sarahí finds comfort in knowing that she is surrounded by people who are consistently teaching her new things and strengthening her every step of the way. She is thankful to all of the nurses who have supported her during this transition. Transitioning to a new career is challenging and one that she has met with open arms. As she embarks on this journey with an open heart and mind, she understands that they key to success in any aspect of your life begins with a simple question, “Are you doing what you Love?” If the answer is no, then you take time to reflect. If the answer is yes, it will show in everything you do. Fun fact about Sarahí: In her free time she enjoys writing, playing guitar, riding her bike, and playing with her two dogs.